We have one party rule,the market is in the tank (again), Obama promises massive new spending and debt, and the Bears lost to the Packers last Sunday. My "Blue Monday" is turning into clinical depression. I need a break from politics and the economy. Lets talk about fish. 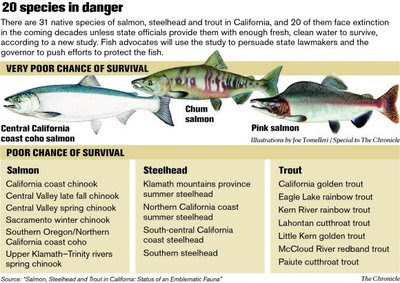 "Most of California's native salmon, steelhead and trout species face extinction by the end of the century unless the state acts quickly to provide adequate freshwater and habitat, according to a study released Wednesday by the state's leading salmon expert. Twenty of 31 species of the prized fishes are in sharp decline, including the Sacramento River winter run of chinook salmon, the Sierra's California golden trout and coastal coho, according to the study by Peter Moyle, a nationally known UC Davis professor of conservation biology... In the 316-page study, Moyle calculated the survival chances into the next decades of 12 kinds of salmon, 11 kinds of trout, eight kinds of steelhead and one species of white fish." The referenced study was commissioned by California Trout, Inc. - a conservation and advocacy group founded by a group of trout fisherman. I've always felt the the most effective environmentalists are the hunters and fishermen and women hell-bent on ensuring that their prey of choice is abundant. As an enthusiastic (if mostly incompetent) "catch and cook" trout fisherman, I include myself in that class (I promise to graduate to 'Catch & Release' if I ever - you know - actually start catching trout on a fly line). "Trout are an "indicator species:" when trout disappear from a lake or river, that watershed is in trouble. When our streams and rivers slow down, dry out or heat up, trout are the first to feel it. When trout they die off in an area, they leave critical gaps in the ecosystem that cannot be filled by other species." It is really pretty simple. For trout and salmon to survive, you need clean, healthy, fast flowing rivers. If you prefer to live in a world (or state) where trout and salmon are plentiful (or even exist), you have to look upstream. You have to get landowners, farmers, grape growers, foresters, road builders and electric utilities to cooperate and stop damaging the rivers where trout and salmon live and breed. Most important, you need politicians to understand that a river and environment where trout and salmon thrive is more important than diverting below market-rate government subsidized water to industrial agricultural interests. Even if they give the politicians a lot of campaign contributions. I've just started working through them. These reports are intended as a wake up call for the public. They can also be used as bludgeons to beat federal, state and local politicians, bureaucrats and utilities into behaving in a way that ensures there will be healthy salmon and trout that I can find, kill and eat. Ensuring that the beatings are applied to politicians with appropriate force and frequency will take money and resources. Send California Trout a few bucks. Help bludgeon a bureaucrat. With an ending line like that you could have posted Monty Python's Fish Slapping Dance as a finale. As usual, an excellent suggestion. For now I'll leave the CalTrout promo in place, but will park the Fish Slap Dance HERE for future reference.